This week Electric Brixton played host to fascinating Parisian duo ‘The Dø’. 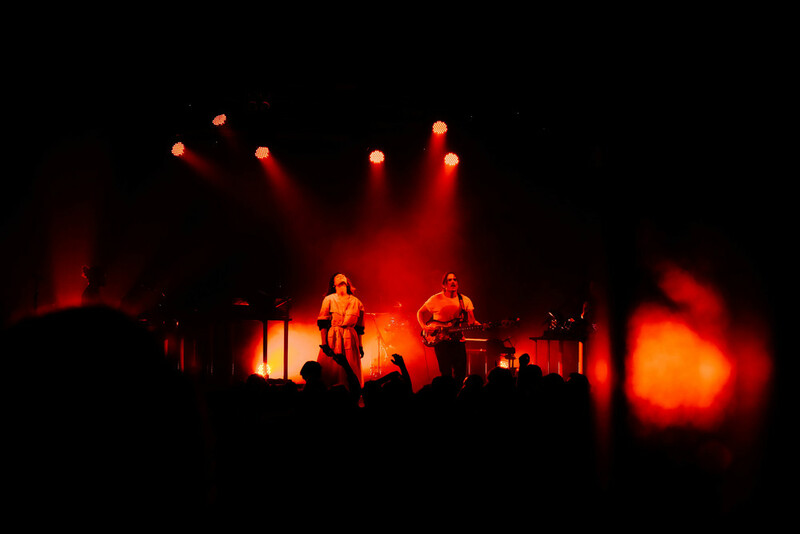 An indie-pop band formed in 2005, The Dø consists of lead singer-songwriter Olivia Merilahti and multitalented percussionist, Dan Levy, who confidently switches between guitar, bass and drums throughout the band’s sets. As soon as they walk on stage, I couldn’t help but notice The Dø’s eccentric style. Like a character out of an anime graphic novel, Merilahti wore a white kimono paired with white high-tops. Noticing three sets of electronic drums, synthesisers and a portable piano on stage, I knew The Dø were going to sound as exciting as they looked. The band’s visuals theme and chosen colourway reminded me of The White Stripes, made quirkier by their Parisian/Scandinavian touch. Incorporating electronic synths, drum pads and Pop-hit melodies, their music is reminiscent of Chvrches, La Roux and Purity Ring. Beginning with a short medley, quieter keys soon built into a dynamic drum defined instrumental. The song ‘Trustful Hands’ filled the venue with its charming lyrics: “we are sentimental animals, we are undercover criminals”. Merilahti’s amazing voice jumped in and out of the track’s plucking guitar and catchy Metronomy-like beats to create an entertaining live spectacle. Swaying freely between funky rhythms and standout lines like “chaos is my second home”, this song truly encapsulates the vastness of sound The Dø can create. ‘Keep Your Lips Sealed’ began with the increasing volume, as the audience flew beside the band as they went into full swing, picking up the tempo as the trio of drums hit at alternating paces. The toms and buzzing mono synths beeped and jumped with a punchy marching like rhythm - think Marina & The Diamonds and Little Dragon. Track ‘Anita No!’ blended flute-like synth and echoing drums with perfectly layered vocals like a Tokyo-pop sounding track. Heavier synth and electronic chords welcomed in a drum-fuelled chorus. The vocal and chords of this song and the great ‘Miracles (Back in time)’ reminded me of a more progressive, upbeat Farao. ‘A Mess Like This’ took a darker, more subtle turn, with Merilahti’s voice skilfully marking a delicate transition from the more energetic songs. Rich organ sounding synth transcended into a dark fading wave of sounds that shortly faded away. ‘Lick My Wounds’ was a big favourite amongst the crowd, with everyone jumping and singing along to its lyric as the toy-sounding synth and crashing cymbals bore witness to Merilahti’s vocals, which built layer after layer. Pausing after this song, she donned a typical cockney accent to shout “Hello London” as we hit the hour mark. Coming in to land, ‘Despair, Hangover & Ecstasy’ hit me straight away with a heavier sound; a tribal experience with the drums battering their way across the rhythm of her poetic voice. Finishing with a bang, the rhythm raced and the volume raised, building up towards the end of the song. Merilahti picked up the mic stand, echoing the feedback from the crowd. “Brixton, let's get electric!” she roared as the audience went wild. After such an energetic night, I can safely say The Dø lived up to their exciting appearance; their entire set was absolutely on point. Check out their new Deluxe Edition of their album ‘Shake Shook Shaken’, which shot up the charts and got to number one in the digital French chart. Find the album here over at iTunes the The Dø's website and Amazon. Check out their Soundcloud and follow the band for more news and images over on their Facebook , Instagram and Twitter.